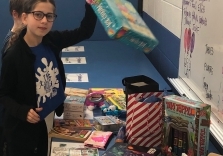 Today students traded gently used toys, games and books for a “new” one of their choice. What a great way to Recycle! This morning we prepared for Earth Day by making decorations out of recycled CD’s. This is a great opportunity to de-clutter. Repurpose games and toys and keep them out of landfills. Students who choose to participate will bring in a gently used toy (NO Stuffed Animals) or game suitable for a 3rd or 4th grader, accompanied by a permission slip. The Exchange will be held during lunch when participating students will select a different item. Reap the benefits of “Reuse” – save money, natural resources and energy. Questions ask Mrs. Salzman in the CLC. West students have been collecting plastic bottle caps all year in our lunchroom. We used them today to make a beautiful school mascot themed mosaic. Please come see our creation displayed in the hallway by the gym. 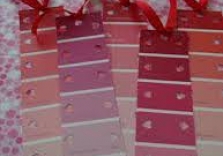 Today, students created Valentine’s Day bookmarks made of repurposed paint samples. Of the Three R’s (reduce, reuse, recycle), there is a reason “reduce” and “reuse” come before recycle. Reducing overall consumption and opting for, reusable items rather than single-use disposables will have better environmental impacts than simply doing our best to recycle. 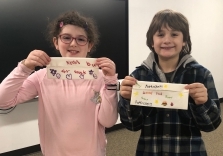 In order to reduce our use of plastic bags for snack time, students made reusable fabric snack bags. 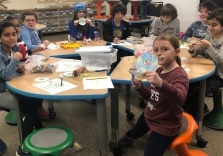 Our recycled art project resulted in fun, personalized holiday gifts. 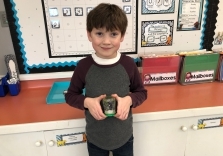 We made photo snow globes out of recycled baby food jars. 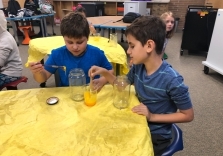 The Green Club is always looking for ways to recycle, repurpose, and reuse items that may normally be discarded. 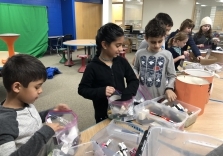 As a combined opportunity for civic engagement and to repurpose, the Green Club collected travel size toiletries like shampoo/conditioner, toothpaste and lotion. At the meeting, we assembled 50 hygiene kits to donate to Night Ministry. Thank you to everyone who donated to this project. We will add toiletries to our regular collections of plastic bags, batteries and printer cartridges at West. 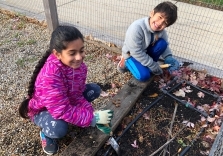 The Green Team learned how to plant fall bulbs for beautiful spring flowers. As we begin the holiday season, it is also a time when our thoughts go to those for whom the last year has brought hard times. As a combined opportunity for service learning and to practice reusing, the Green Team is collecting travel size toiletries like shampoo, soap and lotion. So if you recently returned from a trip and have these around the house- please consider donating them. 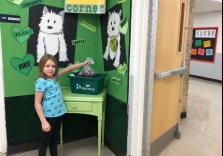 A collection bin will be in West School’s Green Corner. The Green Club repurposed large ice cream containers, donated by Homer’s Ice Cream. 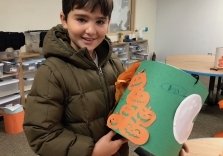 Students used recycled decorations to make fantastic Trick or Treat Buckets for Halloween. 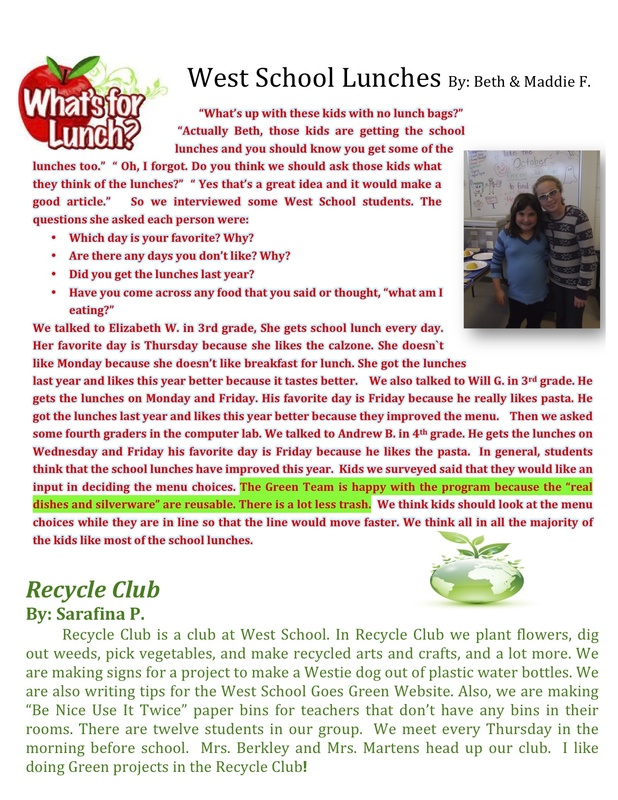 The Green Team is excited that West School has been chosen to pilot a new composting program for the district. Lunchroom food scraps will be picked up weekly by Collective Resource, inc. and will become ​a nutrient-rich soil amendment. West School students have been composting for many years using Green Cone Digesters and a traditional compost bin. The addition of a service will greatly increase the volume of compost, especially in the winter. In addition to all food products, we will now be able to add napkins, compostable utensils, and other paper products. Go Green! 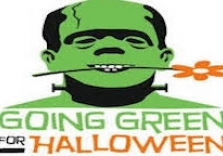 Tips For a Great, “Green” Halloween! 1. Make your own costume from things around the house. 2. Purchase non-toxic or hypoallergenic cosmetics. 3. Trade costumes with a friend, start a “costume closet” to share. 4. Buy treats with minimal packaging - or give pencils, erasers or money. 5. Use a reusable Trick or Treat bag or pillowcase. 6. Don’t be a litter bug. 7. Stay local to trick-or-treat, bike, wagon or carpool. 8. Use rechargeable batteries in your flashlight for trick-or-treating. 9. Don’t throw away the pumpkin seeds - bake and eat, or feed the birds. 10. Compost your old pumpkins. 11. Keep Halloween decorations so you don’t need to repurchase . 12. If you are hosting a Halloween party, use reusable dishes, tableware, cups napkins, etc. Serve from a pitcher instead of individual bottles and cans. Green Club members learned what can and can not be recycled in Glencoe. We also watched a video that showed how paper, glass and plastic are processed at the recycling center. We tested our knowledge by playing a fun recycling relay team game. 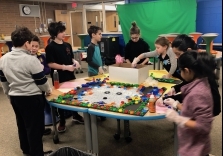 As usual West School participated in the Trex Challenge. Students learned about plastic film and bag recycling. West students collected 866 pounds of plastic between last November and April. That’s a lot of plastic saved from the landfills! Trex collection bins are in the lunchrooms and hallways of West School. What are Green Guides? 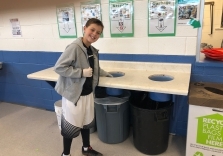 Green Guides are the name for our students that help with recycling and composting. Each week three 3rd grade and three 4th grade students are chosen to man our three recycling stations. 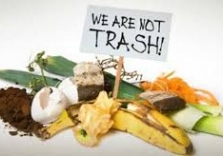 All students learn to separate trash, compost and recyclable items on their lunch trays and deposit them in the correct containers. Our student Green Guides help with this effort as students go through the station. 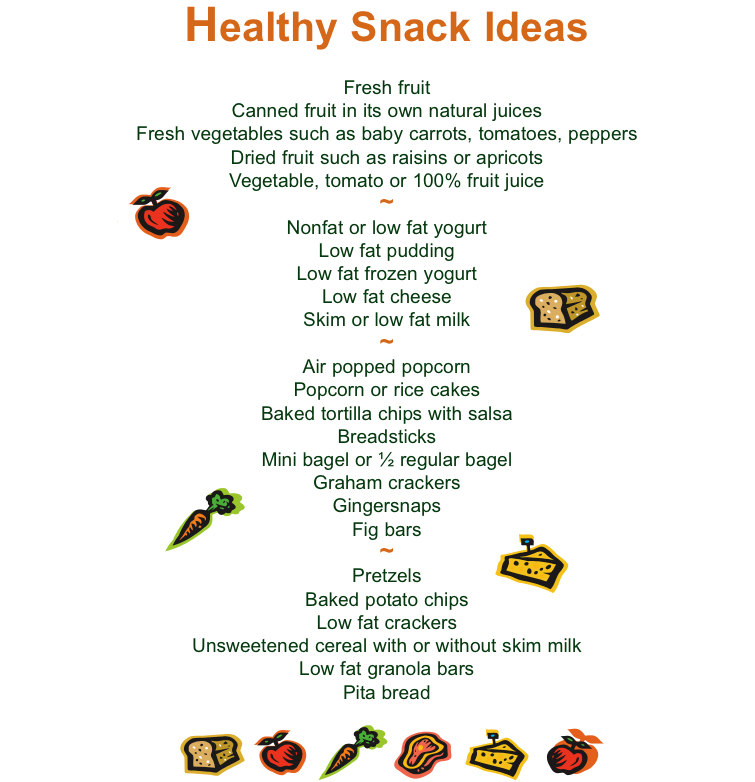 Students bringing lunch from home are encouraged to pack lunches in reusable containers and lunch bags. 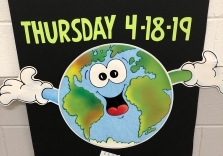 We hope students will develop lifelong green habits and practice them at home. 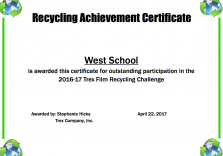 For the seventh year, West School has joined the Trex Plastic Bag Recycling Challenge. Students wil learn the importance of plastic recycling and keeping plastic out of the landfills. 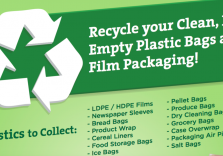 Plastic that is ordinarily not part of Glencoe’s recycle program will be collected in classrooms and the Lunch Room. The bags will be sent to the Trex company where they are made into building materials and home products. The school that collects the most bags will win a bench made out of the recycled plastic. We have won the Chicago area Challenge twice and second place twice! What a great way to help the environment! Look at our video section to see what exactly what can be recycled and how Trex transforms the plastic. Check out the Green Corner in the front passageway to learn about all things Green at West School. In the Corner are recycling bins for batteries, printer cartridges, and plastic shopping bags. All classrooms are equipped with recycle bins, Plastic Bag Recycling boxes and “be nice use it twice” paper containers. These hold paper that is only used on one side. Students will use the other side and then recycle the paper in order to reduce our paper use and save trees. We look forward to our greenest year yet! 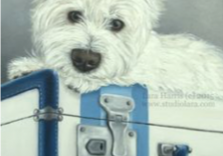 Westies - Join the Green Team! 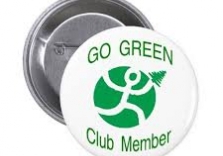 The West School Green Club meets at 8:00 am on a Monday. Session 1 dates are 9/17, 10/1, 10/29, 11/5, 11/19, 12/10. Session 2 dates are 1/14, 2/11, 3/11, 4/15, 5/6, 5/20. Please make yourself at home on our website and be sure to click on the Gallery tab at the top of the page. 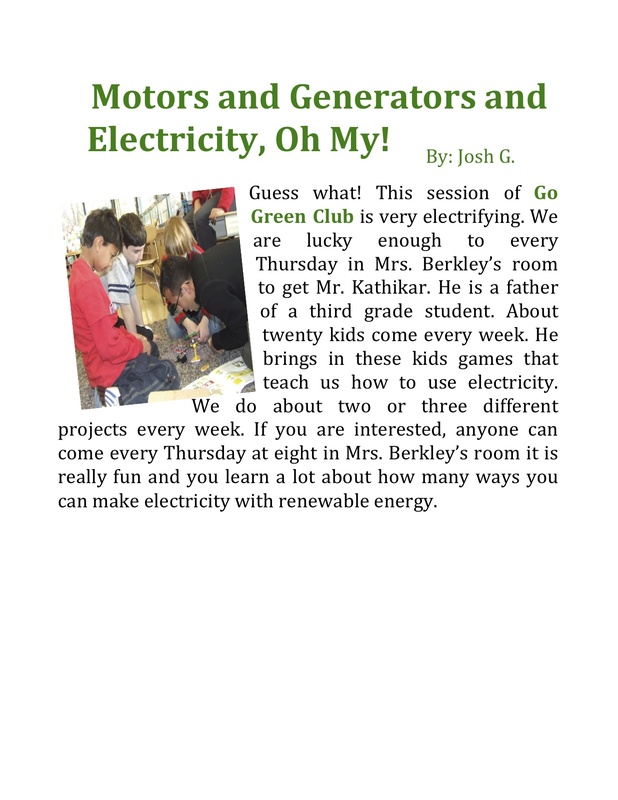 We will be featuring green news, and photos from the Go Green Club, the lunchroom, and classrooms.